Dickson's Gold Bellflower is a cute, small, mounding perennial with golden-green leaves and deep blue flowers from early summer to late summer. It will grow to a height of 6" to 8" tall and 6" to 12" wide. The flowers will attract bees and makes an excellent cut flower. Plant Dickson's Gold Bellflower in full sun to partial sun in moist, well drained soil. 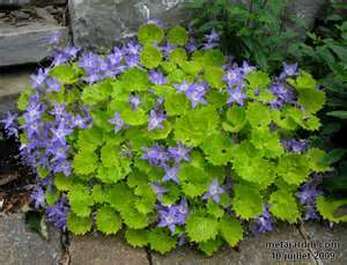 Plant Dickson's Gold Bellflower in a Rock Garden, Cottage Garden, as an edging plant, or in a container. Dickson's Gold Bellflower is also a Firewise Plant.